The GPS program receives national-level attention and guidance from a joint civil/military body called the National Executive Committee for Space-Based Positioning, Navigation, and Timing (PNT). The term "space-based PNT" refers to GPS, GPS augmentations, and other global navigation satellite systems. This is a text description of the org chart. Select any element above for more information. Established by presidential directive, the National Executive Committee coordinates GPS-related matters across multiple federal agencies to ensure the system addresses national priorities as well as military requirements. The National Executive Committee is chaired jointly by the Deputy Secretaries of Defense and Transportation, or their designated representatives. 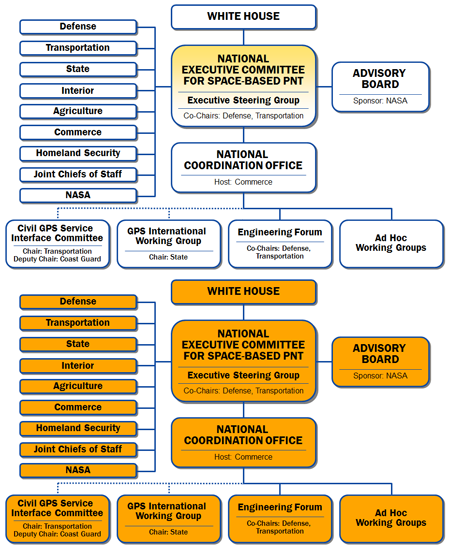 The membership includes top leaders from the Departments of State, the Interior, Agriculture, Commerce, and Homeland Security, the Joint Chiefs of Staff, and NASA. The National Executive Committee generally meets twice a year in closed sessions. A permanent staff in Washington, D.C., provides day-to-day support for the activities of the National Executive Committee. An Executive Steering Group and several working groups support the National Executive Committee through interagency collaboration on specific topics. The National Space-Based PNT Advisory Board provides independent advice to the National Executive Committee from outside the U.S. government. Joint management of GPS dates back to 1996, when President Clinton established the Interagency GPS Executive Board, the predecessor to the National Executive Committee.